← …and it’s not even over, yet! It’s Labor Day! No work! Yay! It’s been a really, really chill day. And, though it’s only 7 pm, I’m exhausted. A girl can only take so much relaxation in one day! Lest you think that all I did was sit on my duff, know that it wasn’t all fun and games. Lindsey and I knocked out 5 miles this morning. Go us! I was less than thrilled when she suggested that we do that route. That feels like a really long ways now, despite the fact that just a few months ago that was a normal distance; so normal, in fact, that it was a distance that we could manage in the time between leaving work and needing to eat dinner. Today, however, it was a bit bigger of a deal. Once we returned home, having run and conquered, we decided a dip in the fountain was in order. Because, honestly, what would feel better than splashing around in some cold water after a hot run? Nothing, I tell you. Nothing. Once they’re all chopped into bite size bits and in the casserole dish, drizzle 1/4 cup extra virgin olive oil over all the veggies and toss it all together so that the EVOO coats everything. THEN…don’t forget your spices! I sprinkled garlic salt, pepper, rosemary (yum! ), and oregano on top and then tossed it all together again so that the spices mixed around. Use whatever spices your prefer in whatever amounts. Now, pop it into your (preheated to 350 degrees) oven and let it roast for 70 minutes, stirring occasionally. And there ya have it! 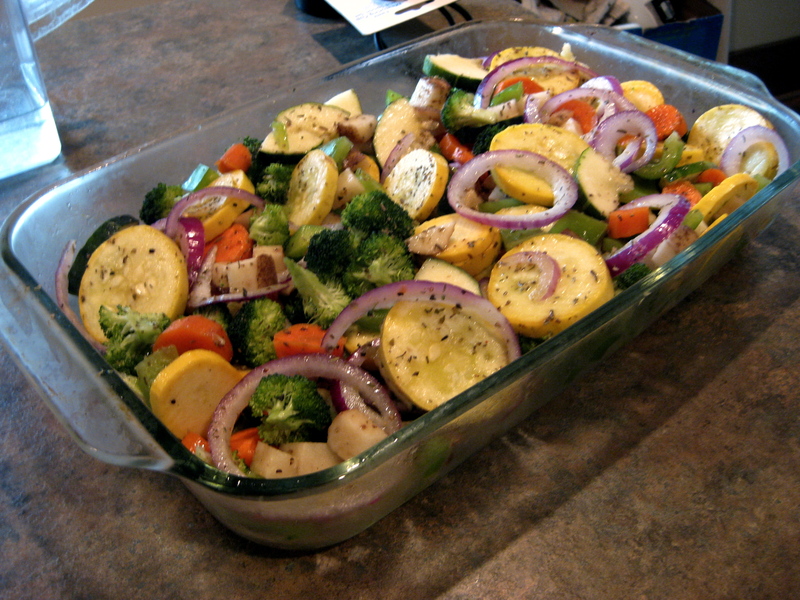 Roasted vegetable goodness! Enjoy the last little bit of the long weekend, friends! This look quite good! I love veggie-based dishes!